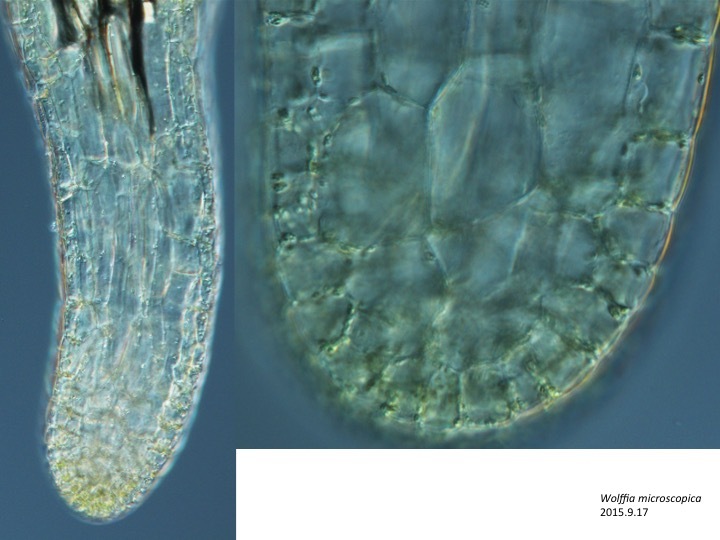 Wolffia microscopica forms an unusual organ, pseudoroot, which originates from the lower surface of the frond and whose function is speculate to increase the photosynthetic amount since the pseudoroot cells contain substantial amounts of chloroplasts (Sree et al. 2000). Sree, K.S., Maheshwari, S.C., Boka, K., Khurana, J.P., Keresztes, A., and Appenroth, K.-J. 2015. 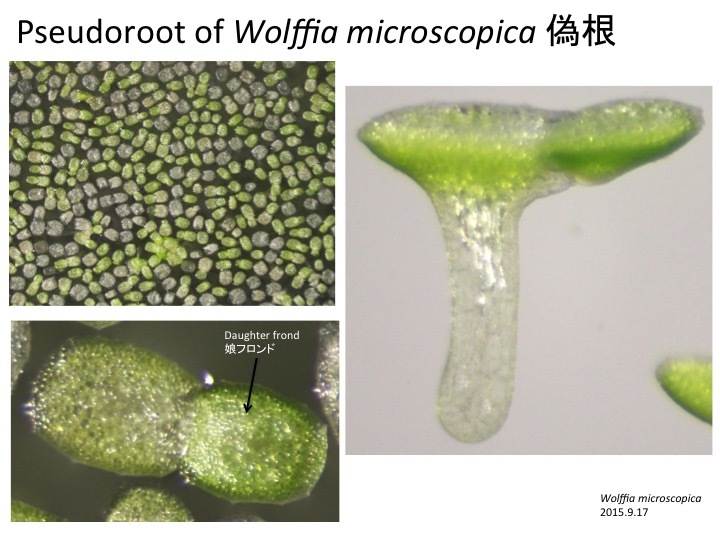 The duckweek Wolffia microscopica: a unique aquatic monocot. Flora 210: 31-39. The pseudoroot bears an outermost layer (L1) of cells smaller than inner parenchymatous cells. The tip of L1 layer cells contain stem cells with division activity to self renew by longitudinal cell divisions and also to produce inner parenchymatous cells with periclinal cell divisions. The development is similar to that of leaf margin rather than shoot or root apical meristem because of the lack of lateral organs. The radial development is similar to that of abaxialized or adaxialized mutant leaves (Nakata et al. 2012). Nakata, M., Matsumoto, N., Tsugeki, R., Rikirsch, E., Laux, T., and Okada, K. (2012). Roles of the middle domain-specific WUSCHEL-RELATED HOMEOBOX genes in early development of leaves in Arabidopsis. Plant Cell 24: 519-535.